As you enter the upstairs space, the massive cast are already on stage. You are quite taken aback by their number, 27 in total and all female. They are huddled together in groups, talking amongst themselves and in costume. They wear dishevelled grey work clothes with scarves covering their hair. The stage is filled with scaffolding to form bunk beds or other platforms for the actors. The back drop is covered in numerous sheets of sack cloth, adorned with French words and various images of the female form. And so this most unusual production begins. 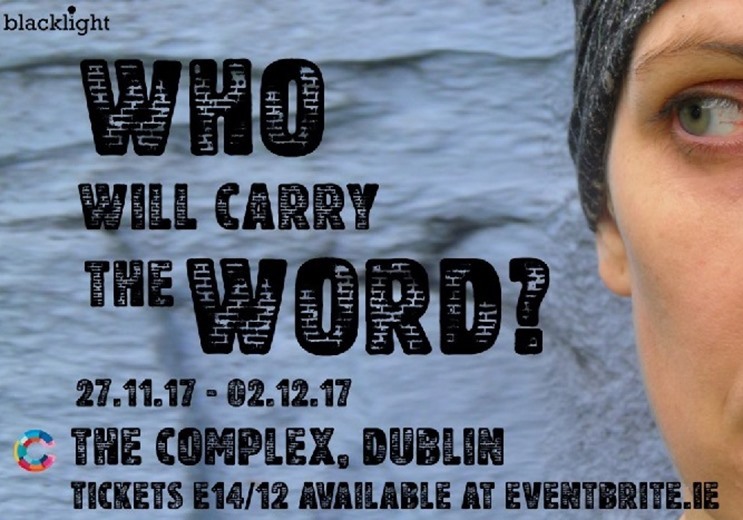 ‘Who Will Carry the Word?’ is the work of Charlotte Delbo who is a French writer born in 1913. She was a member of the French resistance during the war and was sent to Auschwitz concentration camp in 1943. She was one of the few non-Jewish people sent to the camp. This work is about her time spent in captivity. The play starts with the author sitting at a table smoking. It is after the war and she has resumed her life, although scarred by her experience. The author wears fashionable clothes and her hair is visible, in stark contrast to the rest of the inhabitants of the stage. She starts to recount her experiences to the audience. The device works well to introduce the work and also to contrast her past and present life. We meet the prisoners on their 8th day in the captivity. They have already endured much and there is a mix of emotions within the group. There is a discussion on the merits of suicide. Is there any point to continue to hope when the outcome is inevitable? This short piece gives you an impression of the complexity and power of the issues being discussed. While there is a very large cast, there are a smaller number with significant speaking roles. Aoife Honohan and Maureen Rabbitt play the author at various stages of her life; in the camp and afterwards. Hannah Osborne is also worthy of a mention for her various roles. There are 9 ‘lead cast’ members with the rest of the cast filled out with students from ITW and Dublin Stage School. The ensemble really adds to the experience and make the production more powerful. This work was no doubt created on a shoe string budget and considering these limitations it is a powerful piece. The simple style of the production works well and it evokes the place and time. This is the Irish première of the play and the company deserves much credit for bringing it to our shores. It is hard not to fall under its spell and be transported to another place and time. When you spill out onto the busy streets of Dublin after it finishes you are haunted by its images. 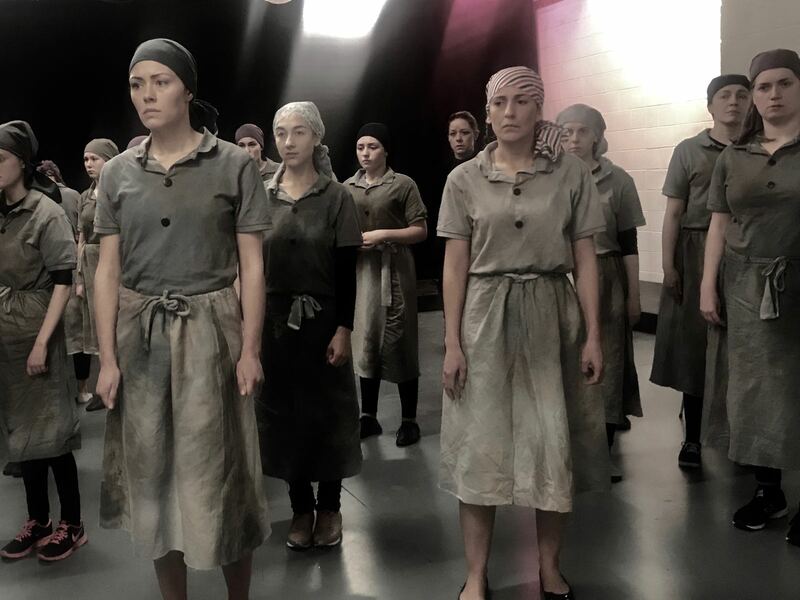 The words of these women will not be forgotten and this production reminds the viewer of this shocking period of history. Sound Designers: Jack O’Malley and Brian Cullen. Supporting Cast: Students from ITW and Dublin Stage School. As I have commented elsewhere, I am the forgotten translator of the work, so I d like to be remembered. Cynthia J Haft. Translation was published in the USA in 1983, Charlotte was my Gdmother, I feel too it is unfortunate the production was deprived on my input. I have read other works by Charlotte Delbo, but I have not read this play – so, thank you for the review and the suggestion.